Kuroki is a hamlet in the Rural Municipality of Sasman No. 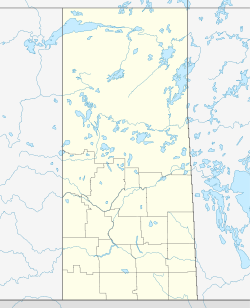 336, Saskatchewan, Canada. Listed as a designated place by Statistics Canada, the hamlet had a population of 50 in the Canada 2016 Census. The community is named after the Japanese general Kuroki Tamemoto. As an interesting aside, this village was founded after the Japanese had won several victories in the war against Russia (Russo-Japanese War 1904-05). Britain was allied with Japan in this war and Japan was a very popular nation throughout the British Empire. Three towns in Saskatchewan were named along the CN line in memory of the Japanese achievements in this war: Mikado, Togo and Kuroki. A Japanese Garden was created by residents, complete with rock gardens and small pond. It has a sign in Japanese saying "Kuroki Japanese Gardens." On the western edge of town there is a small Ukrainian Orthodox church and St. Helena Cemetery. The grain elevator still stands in good condition but has been purchased and is now owned privately. ^ "2016 Community Profiles". 2016 Canadian Census. Statistics Canada. 21 February 2017. This page was last edited on 3 December 2018, at 07:56 (UTC).